I've labeled this section of my blog Restaurant of the Month, but with there being so many great restaurants that I have visited over the years, it's almost impossible for me to give credit to only one Restaurant per month. That would mean that I would only mention twelve a year, or five this year, because we only have five months left until December (Damn it’s going fast!) and there are way too many good eating places for me to only mention five. 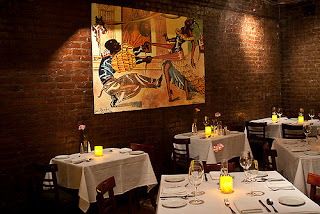 So I will leave this section labeled Restaurant of the Month in honor of how I came to know many of these restaurants. But this could turn into Restaurant of the Week or Restaurant of the Every-Other-Week. Whatever, we'll see what happens. Disclaimer: There will be many, many Latin restaurants mentioned in Restaurant of the Month because as I mentioned in Undies in a Bunch I am lover of Latin… almost everything. I'm a sucker for a happy hour special and in this economy, we all should be. Havanna 27’s happy hour is Monday - Saturday from 3pm - 7pm. All drinks and appetizers on their happy hour menu are ½ price. 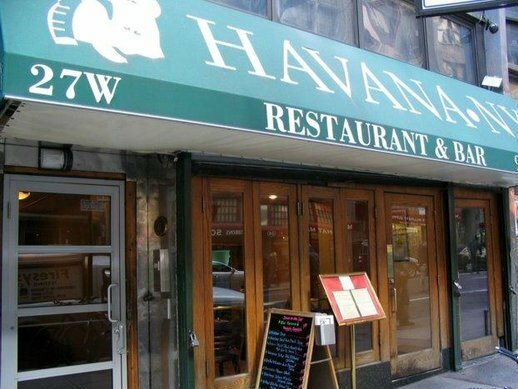 I haven't eaten an actual meal at Havanna 27, as I am an appetizer whore, but the appetizers are delicious so I'm sure the entrees will not disappoint. 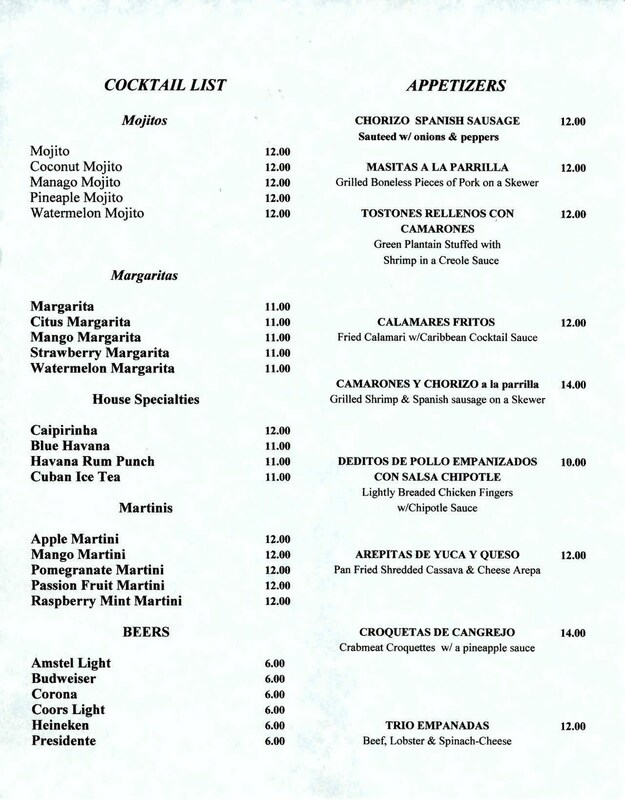 From this menu I have had the Tostones Rellenos Con Camarones (Green Plantains Stuffed with Shrimp in Creole Sauce). The tostones are molded into mini bowl shapes and filled with shrimp and the yummy Creole sauce. This is my favorite item on their menu. I have also had the salmon cakes, which I don’t see on this menu, but I’m sure they serve. The salmon cakes are breaded and fried to crunchy perfection and the dipping sauce for the salmon was so good that I dripped it over the garnish the salmon cakes were presented on and gobbled the garnish up too. 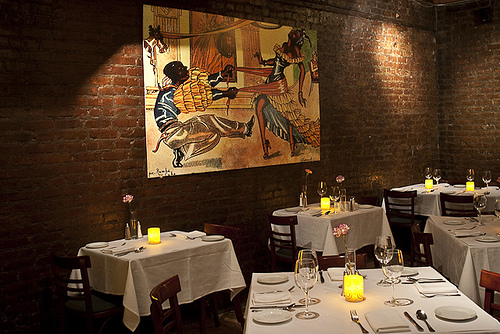 The interior of Havanna 27, reminds me of David's Cuban Restaurant in Miami with the lively Cuban artwork on the walls. The exposed brick, perfect amount of low lighting (not so low that you can’t see your food) and tea light candles glowing on the tables gives this restaurant a cozy, warm feel. And the restrooms are kept clean! That has nothing to do with the food, but it makes me feel so much better about the food I am eating when the restrooms are clean. Depending on which night you visit Havanna 27, it could be a perfectly pitched atmosphere, as far as noise level goes, or it could be a tiny bit loud by the bar, which is understandable. I am an old lady trapped in a young woman’s body and do not like to have to yell at the person I am having dinner with, but if you get a drink in me, I blend right in with the noise-makers with my tipsy loud mouth. In no way am I a restaurant critic and I will not be bashing any restaurants in my Restaurant of the Month blogs. I only want to share the good places to eat, so that you also can have a nice dinner that is healthy on your pocket. 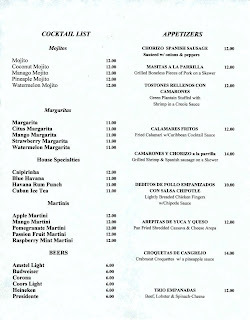 Visit their website to view more of their menu options. Enjoy, and until next time, happy eating!